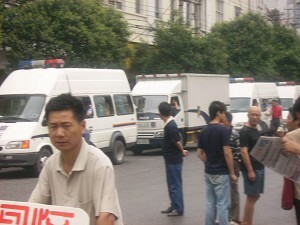 Over one thousand armed police officers, riot police, and City Management police officers suddenly congregated at Hualou Street, Wuhan city on the morning of June 23, 2007 to arrest human rights defenders. The police busted into the homes of local human rights defenders whose names were on the authority's black-list. 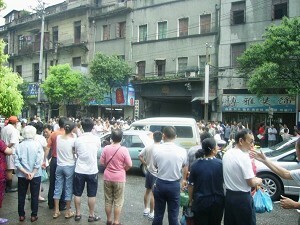 It was reported that Mayor Li Xiansheng had authorized this operation as local resident groups had protested his plan of forcefully relocating the Hualou Street. On May 20,.2007, nearly a thousand residents and human rights defenders had held a general assembly meeting to ask the Chinese authorities to investigate the collusion between their local government officials and a businessman. The event resulted in the issuing of a warrant for the arrest of the meeting's organizer, Yu Zhenghua. But Yu was tipped off and ran away before police could arrest him. Meanwhile his home was surrounded by more than ten police officers. However on June 23, 2007 at about 6 am, 4 to 5 human rights defenders were arrested by more than twenty police officers who forced their way into their homes. A female resident was even dragged out from her bed. Later, as local residents gathered at the local police station, protesting for and demanding the release of those arrested, around one thousand police officers were sent to disperse them. Some of the residents were beaten and arrested as they were either taking photos or filming the proceedings. One elderly woman surnamed Yu was injured during the crackdown. She is believed to be 80 years old. As part of the operation, City Management police officers used long bamboo poles with sickles tied on their ends to remove all the banners from street. They were demolishing the street and preparing for the forceful relocation. The police officers did not leave until 3 pm that day. According to local residents, the operation was Mayor Li Xiansheng's promise to Zhou Weixin, the General Manager of Hutchison Whampoa Property, Hong Kong. Li was to personally supervise and seize the human right defenders who had organized the assembly on May 23,2007. Hutchison Whampoa Property, Hong Kong had secured the land near Hualou Street a few years ago with a 1.1 billion yuan (approximately US$141 million) bid. The entire site area is nearly 120,000 square meters (1.3 million square feet) and the land is zoned as both a commercial and a residential district. Wuhan city local government had not obtained the right of ownership for this site before they sold the property to Hutchison Whampoa Property. Neither did they inform or ask for permission from the local residents., The residents thus became distressed as their local government had used forceful and foul means to get what they want. They suspected that Mayor Li Xiansheng had abused his political status in exchange for personal gains with Hutchison Whampoa Property, Hong Kong.